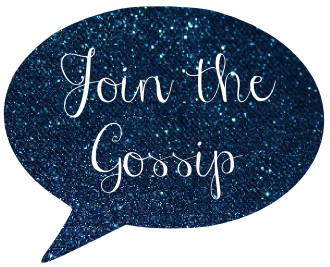 Join The Gossip: April, I love you! The Conan Show today. Aziz Ansari is a guest, who I think is hilarious and have seen perform standup a few times. If you have no idea who he is, he's Tommy on Parks and Rec. This weekend is Easter which means, family, friends, and food! Next week I am going to my sorority's formal as an alum. The next day I am either going bar hopping in San Diego or to see a friend's friend's band play at The Troubadour in LA. Then is a charity event that involves running around through rainbow colored dust. Not only are two great friends joining me, but so are my bloggin' buds Meg of Henning Love and Selma of Crazy Little World of Mine. Finally I'm off to New Orleans for five nights and six days. I am a crazy trip planner and our days are full of fun events ranging from a swamp tour to Jazzfest! See, April is pretty damn amazing. And if that weren't enough, the first week of May is pretty spectacular, too! The day after I get home from NOLA I get to see Coldplay at the Hollywood Bowl. Yes, there's more. That weekend, Cinco de Mayo, I'll be lounging by the pool, complete with lazy river and water slides, at a beautiful Palm Springs resort. After such bad luck and work stress for the past several weeks, these adventures are exactly what I need to stay sane. Wow! You do have a wonderful line up of events to go to... do Enjoy! Jealllllous! It seems like things are looking up! I just signed up for The Color Run. It sold out in 6 hours here! That Hollywood Bowl picture is so pretty! And that resort looks awesome. My parents are going to Palm Springs in May and had a few days left on their time share, but Jacob can’t swing the days off. Bummer! I’ve always wanted to go. You will be a busy busy girl! Sounds like so much fun though! So jealous that you're going to NOLA! Sounds like such a fun month! We have the Festival of Colors here at the Hare Krishna temple down by my parent's house, and they throw the colored chalk and it's so much fun! I missed it this year thinking I'd just go to the one closer on the 14th, but then realized that I will not be around that day. Boo. What on earth? How the heck do you have so many vacations/awesome things planned??? Obviously I need to hightail it south! I love April too -- but you have such a killer month planned! From the little things (Conan) to your vacations and fun! Jealousssss. seriously, so jealous of conan AND coldplay. i saw coldplay back in 2005 and it was the best live performance i had ever seen!